Liberty! Human Rights! Choice! Prosperity! Freedom! Advocates see the “neoliberal agenda” (i.e. freeing the market from constraints such as regulations and tariffs) as going hand-in-hand with freedom, even when the results across the world tell a very different tale. We barely have to look before finding new new waves of protest (e.g. Turkey, Brazil, and Slovenia) against the intimate connection between neoliberalism, corruption, authoritarianism, and austerity measures. With the collective wisdom of those who have dedicated their lives to diverting the oppressive framework of the “free market,” I’ve worked to make this guide represent current activist thoughts and strategies. If as you’re reading this you find yourself saying “but what about…?” or “I know a great resource/example to share!” then I’d love for you to leave a comment at the end of this post or send me a message. So what is neoliberalism exactly? At it’s core, neoliberalism is an economic system working on eliminating government regulations, trade barriers, and tariffs (and possibly government altogether) along with privatizing as many aspects of society as possible. These demands are about shifting responsibility from the government to the private sector to handle improving peoples’ lives. So what this means for a neoliberal is we need to structure our entire society, family, government, relationships, etc. around the idea of the “market”. One reason neoliberalism is a confusing concept is that many people and institutions accept its starting points (e.g. growth is always a good thing and it will help everyone over time) without even digging into whether these “foundational precepts” are actually true. Neoliberal economists promote these concepts as “common sense” and “necessary,” and by-and-large have entered our everyday language with little analysis of their underlying impact. Along with “normalizing” our vocabulary under neoliberal precepts, Elizabeth Martinez and Arnoldo Garcia note neoliberals also aim to switch our values of the “public good” and “community” to a value-system based on the “rule of the market” and individual responsibility. It’s a very black-and-white world for a neoliberal. One in which every person has sole responsibility for their success, and corporate expansion is good for all. 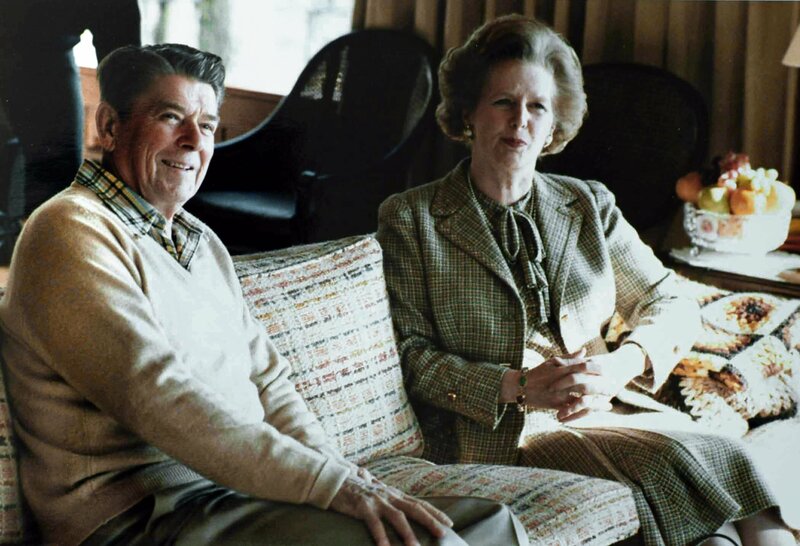 The photo above shows a photo of former UK Prime Minister Margaret Thatcher and former US President Ronald Reagon, both of whom were integral to implementing neoliberal policies and ideas. For an in-depth analysis of the forms of neoliberalism in economic terms, check out this great resource. So to recap in a sentence…neoliberalism seeks to privatize, deregulate government, cut social services, and shift values from the public good/community to values based on “rule of the market”/individual responsibility. Now that we’ve gone over some of the main aims of neoliberals, one important question remains…Why do neoliberals view a completely free market as the ideal system? How do neoliberals truly view their movement? What motivates or influences them to force their policies on the rest of the world? These neoliberal worldviews are based in the unwavering belief in a “free market.” Even though many of these ideas lack any kind of scientific evidence in their favor. Neoliberals will rarely call themselves “neoliberals” by name, so these frames below will help you identify narratives based in questionable logic. Neoliberals believe the market economy is “natural” and “self-regulating” (i.e. “the invisible hand of the market”). Adam Smith, one of the founders of capitalist thought, saw the “natural laws of the economy” as exactly that…“natural.” He believed that a totally free market would tend toward balance on the whole. Economists tend to use these assumptions that the market will “self-correct,” even lacking any scientific validity. People control the market, and those with the most power will often make sure the “invisible hand” benefits them. There is a clear distinction between individual greed and corruption. The neoliberal model structures itself around individual vice and greed pushing forward economic growth. However, they believe corruption happens in only a few cases and is not related to a systemic problem within neoliberalism. However, wealth IS NOT “trickling-down” (e.g. for reasons such as tax havens and just generally the wealthy sitting on their funds). So while some business growth is positive for the rest of society, there are numerous cases where corporate gains are really just good for a small group of people. Government is inefficient. Related to the last point, neoliberals see government as standing in the way of a completely “unfettered” expression of capitalism. With regulations, tariffs, and workers’ rights governments across the world reduce the private sector’s ability to more efficiently solve the problem. When was the last time you actually saw a study proving government is inefficient? In general that’s just a talking point to obscure the fact that government is often much more efficient than business (this is especially true the bigger the company is) and corporate efficiency is a myth. Individual responsibility is key to self-advancement. Social services and the “public good”/commons weaken one’s ability to succeed in the free market by putting them under the control of the state. Everyone has the ability to succeed if they work hard. In particular, entrepreneurs are essential to responding to market needs. This myth that “everyone can pull themselves up by their bootstraps” is increasingly, and unfortunately, becoming more and more a fairytale (e.g. as shown by the stagnation of social mobility). This myth also perpetuates classist and racist views and policies. The “free market” = a “free society.” Neoliberals view their project as the best way to advance justice, reduce poverty, and institute democracy. Liberty in all areas of life! This next section looks at how these dominant frames underlying neoliberal thought are slowly seeping into areas beyond just economics. So now that we’ve gone over many of the main attributes of “unfettered capitalism,” what does this look like in today’s modern political and social climate? Below are some of the key ways neoliberal advocates attempt to bring about their visions. In both the K-12 and higher education system, there is a trend toward viewing students and schools as mere pieces in market-driven forces. This can range from those pushing for “school choice,” giving parents “vouchers” to help pay for sending their children to private schools, and the proliferation of unregulated corporatized charter schools. All of these measures are steady moves for a complete system of private institutions and an end to all public education. Education is just one example of government outsourcing its responsibility and accountability to outside contractors (e.g. private prisons). The rise of government privatization also brings about increases in corruption and cronyism. Austerity measures and deep cuts to social spending go hand-in-hand with this neoliberal model of government. Naomi Klein notes how our government agencies more and more try to turn over homeland security and disaster reconstruction efforts to private companies. She notes how this creates a “disaster economy” where terrible events are needed to stimulate the market. Shouldn’t we be aiming for stabilizing the economy and reducing the number of disasters, rather than creating a vast market that feeds off and at the very least does little to prevent these events from occurring in the first place? As noted above government entities increasingly aim to outsource their obligations over to private companies, but they also do the same for social services.Now nonprofits have become so linked to government and business interests, there is often little to distinguish between them. INCITE! notes that foundation and government funders force nonprofits to only provide social services, as opposed to working for social change. In particular, the nonprofit industry increasingly have to look at their members as “clients” and other commodified versions of the people powering our movements in order to fit into the neoliberal dynamic. Now let’s look at some the tools and dynamics neoliberals use to institutionalize their struggle to bring “liberty” to the market to these systems of education, government, etc. I’m specifically pointing out the following ways neoliberalism becomes entrenched in our systems, in order to support all of us in recognizing them when they appear (as many are encased in seemingly innocuous rhetoric). The title of Naomi Klein’s momentous book The Shock Doctrine: The Rise of Disaster Capitalism, the “Shock Doctrine” describes the neoliberal approach to use every “crisis” (i.e. “shock”) as an “opportunity” to remake society in the neoliberal image. Shocks can be any kind of shock to the overarching systems such as: natural disasters, violence/conflict, political crisis, wars, etc. You can see the immediate calls for neoliberal “reforms” in response to “shocks” all across the world, from Haiti to Greece. Friedman expanded upon this to say a neoliberal economist’s main function is “to keep them [neoliberal ideas] alive and available until the politically impossible becomes politically inevitable.” In other words, those wishing to implement the neoliberal agenda must always be ready to instil their ideas. The reason neoliberal policies often require “crisis” is that people would never accept such “reforms” under usual circumstances. Neoliberals in all sectors of society have used the “Shock Doctrine” to steadily enshrine neoliberal ideas all across the globe. If neoliberal policies were so unpopular with the majority of people, how did they get the support they needed to become so widespread? One of the key methods that propelled forward this approach to the economy, was a small network of academic institutions and think tanks that financed a new generation of economists (e.g. Chicago Boys) who filled many branches of the public and private sector. Some of these main organizations include: the University of Chicago’s Economics Department, the Ford Foundation, the Heritage Foundation, the American Enterprise Institute, the Project for the New American Century, and the Cato Institute. The globe’s main financial institutions (e.g. International Monetary Fund [IMF] , World Bank, and Federal Reserve) came together under the “Washington Consensus,” which outlined a series of steps any country that accepted “aid” had to implement. This “Washington Consensus” formed a key framework that forced nations across the world, despite significant resistance, to adopt neoliberal policies (e.g. privatization, elimination of barriers from foreign markets, and reducing the size of the state). Structural Adjustment Policies (SAPs) are one of the key tools used to implement the “Washington Consensus.” The IMF/World Bank use SAPs as a prerequisite for those in the Global South to change their entire country along neoliberal lines in order to receive a loan. These new policies had numerous negative impacts, such as the opening up of countries to the full onslaught of the global system which decimated local markets. The more wealth a country or corporation has in the neoliberal model, the easier it is gain even more wealth. Since wealth is power in the neoliberal system, this means the wealthy also get to make the decisions. Most importantly, once a country willingly or forcibly enters the “free market” they are then required to play by the dominant “rules of the market” which favor the wealthy. As noted previously, popular protest has always been strong against the neoliberal agenda. So how did free market ideologues succeed in the face of such opposition? Naomi Klein highlights that many political leaders, both dictators (e.g. Pinochet in Chile and Suharto in Indonesia) and democratically elected leaders (e.g. Paz in Bolivia and Thatcher in Britain during after the Falklands War) used some form of repression, presence of war, or violence to force through a neoliberal regime change. The reason these examples often gets hidden in the history books, Naomi Klein notes, is due the rise of human rights activism which focused on military oppression and not economic oppression. Cognitive dissonance occurs when a person holds two or more conflicting ideas, pieces of information, etc. Cognitive dissonance at its core is the process of trying to make ideas live up to reality, even if the opposite is the case. Advocates of neoliberal theories often demonstrate this cognitive dissonance when it comes to viewing their free market failures. How many times do we have to witness deep economic declines, before realizing corruption and greed are intimately connected to an economic system based on individual advancement? Another common refrain is that of “trickle-down economics” or the idea that money will “trickle-down” from rich individuals and corporations to everyone else. However, this “trickle-down” doesn’t actually happen to a great extent, wealth accumulates in “pools” for the rich. So as long as neoliberals continue to ignore the realities of their program, they will continue to ignore the deeply negative implications of their policies. Now that we’ve gone over what neoliberals do to instil their agenda into society and their worldviews of why they do so, it’s time to look at specifics of what we can do long-term to combat them. After laying out the key elements of the neoliberal ideology, now I want to highlight some of the most promising ways to dismantle this system and create a new economic paradigm that truly reflects our positive values. As activists and organizers in different fields there many ways we can go about combating neoliberalism, but these next few sections outline some of the most important things we must do in order to be successful. Action 1: Undermining neoliberal frames with the truth. As I wrote above some of the neoliberal beliefs (e.g.the market economy is “natural” and “self-regulating,” “free market” = a “free society,” etc.) just don’t actually have any basis in fact. We have to confront these ideas wherever they appear and make sure folks know the coercive history of how these thoughts became imbedded in our political discourse. Enshrining these values into dominant discourse is not something that can happen overnight, we must continually push over the long-term to make them a reality. Whether this means enacting policies as preventative measures or identifying their impact so people can see their hidden purpose, we cannot allow these tools to continue the expansion of neoliberalism. As noted earlier in this post, most people are very resistant to neoliberal policies and programs; however, through the “Shock Doctrine” and other means of using confusion/fear, neoliberals push through their ideas without even people realizing. If we had this “radical transparency” it would be much more difficult for neoliberals to institute their anti-democratic ideology. It’s definitely a shift in thinking to consider “what can we do”, instead of “what can I do?” However, there are plenty of legal frameworks for making this transition easier and acceptable to an array of folks. The commons framework is just one way we can push back again hyper-individualist narratives and create one that shows how much better our economies would be if we shared resources instead of competing. Action 6: Neoliberalism has seeped into nearly every type of organization (e.g. government, business, nonprofit, and community groups) so each of us has the challenge/opportunity to disrupt its growth. While I don’t believe individual resistance will be enough, its definitely a piece of the solution and we have to keep the spark burning until that “movement moment” arises. Action 7: We must sustain multiple “movement moments.” Just like there isn’t one solution, its going to take more than 1-2 movements. Latin America’s inspiring movements against neoliberalism and Occupy Wall Street are certainly fundamental efforts in this cause, but it’s going to take long-term opposition in order to seriously challenge our dominant institutions. 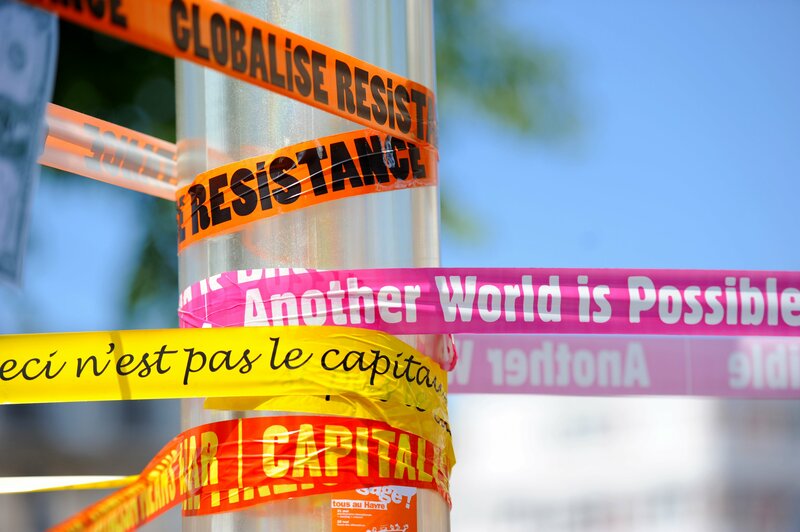 For a great summary of some of the historical and current movements, check out this piece covering worldwide resistance to neoliberalism. Action 8: Remember all our movements need to build on and mutually support each other. Whether we’re calling for indigenous sovereignty or racial justice, we have to seek out ways to create intersectional movements. Action 9: When I feel confronted by the enormity of our neoliberal structures, I turn to those who continually show me new ways to maintain the struggle. Just to mention a few, I look to Naomi Klein, Arundhati Roy, Zapatistas and other landless/indigenous groups (e.g. Ogoni people in Nigeria and the Landless Rural Unemployed Workers Movement [MST] in Brazil). This means we need to demonstrate the incredible array of options beyond our current capitalist systems. Adbusters reminded that even though neoliberal policies created the 2008 financial crisis, few people saw feasible options beyond neoliberalism. We have some powerful ideas, but they aren’t dominant to be widely championed at this point. Action 11: As implied by the last point, we need a cohesive alternative economic development model to fundamentally challenge the neoliberal ideology. For example, the New Deal framework of the early 20th century showed how government should serve as a positive role in the economy and should be based on our positive values. While government may not be perfect in every scenario, the potential for making a system based on thoughtful values (e.g. transparency and mutual support) is much higher than neoliberalism which is based on destructive values (e.g. consumption, greed, every person for themselves). As you probably already know, neoliberalism is not something one or a group of people will ever be able to change on their own. I laid out a few of the ideas that seem to have some of the highest chances for making a dent in the neoliberal culture, but you have to identify exactly how you wish to combat it. There’s no “one way” so that means applying these and other counter actions to your activist routines and finding ways to integrate them into your current or future campaigns. I know it’s going to be terribly challenging to keep up this struggle that has been going on for decades, but we must learn from those who organized before us and to build on their efforts. Just remember that countless people are currently pushing back against neoliberalism and we just have to keep on pushing to finally dismantle the neoliberal ideology. In order to make this an even more “complete” guide to dismantling neoliberalism, please leave a comment below with your ideas for additional actions or things all of us should know.